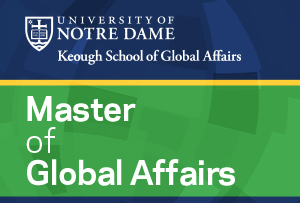 The University of Notre Dame’s new Donald R. Keough School of Global Affairs announces the opening of applications for its inaugural academic program, the two-year professional Master of Global Affairs. The program is designed to prepare new generations of leaders and agents of change in governments, nongovernmental and civil society organizations, and the private sector. “The world clearly needs more highly skilled, effective and ethical leaders, and Notre Dame — with its global reach, powerful mission and accomplished teaching and research community — is prepared in a distinctive way to contribute to the education and training of global professionals,” said Scott Appleby, Marilyn Keough Dean of the Keough School. All students in the interdisciplinary Master of Global Affairs will receive rigorous training in the broad field of global affairs and skills training to match their career aspirations. They will choose a concentration in Sustainable Development or International Peace Studies (which builds on the 30-year-old program of the Kroc Institute for International Peace Studies) or Global Affairs with options to specialize in areas such as economic development, global religion, human rights, international law, environmental sustainability, international politics, governance, conflict analysis and mediation, or regional or national cultures and history, among other areas. Distinctive features of the master’s curriculum include integration labs organized around real-world problems and extensive field work with Notre Dame partner organizations in Africa, Asia, the Middle East and Latin America. Students will graduate with two full years of practical experience, positioning them for high-impact careers in a wide range of global fields. All qualified students will be eligible for a tuition scholarship and stipend. The deadline for applications is Dec. 15. Classes begin in August 2017. The Keough School of Global Affairs — the University of Notre Dame’s first new school or college in nearly a century — is named in honor of Donald R. Keough, one of the most accomplished executives in U.S. history and a life trustee of the University. Originally published by Joan Fallon at news.nd.edu on July 25, 2016.